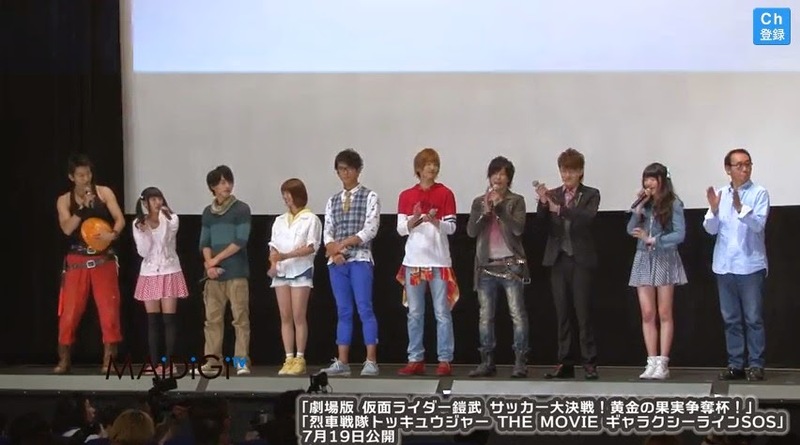 With almost a week left before the premier of the summer films, here is the latest stage greeting video of the cast of; Kamen Rider Gaim: The Great Soccer Playoffs! The Golden Fruit Cup and Ressha Sentai ToQger: The Movie - Galaxy Line SOS. The video also features Kabuki actor, Ainosuke Kataoka the Sixth talking about his experience during filming. In ToQGer, the Safari Ressha gets derailed and arrives on Earth. Due to insufficient energy, it couldn't go back to the Galaxy line. Safari Ressha conductor named Lady, explains to Right about the situation and he now crafts a plan to help the conductor. Aside from Count Nil, Hound Shadow also makes an appearance.